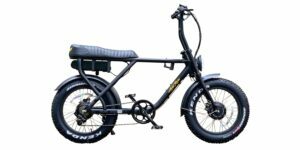 The OHM City is an approachable urban electric bicycle that comes complete with fenders, a rear rack, and integrated lights… in four frame size options. 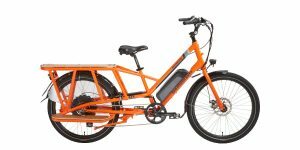 And hey, it also comes with two motor choices?! 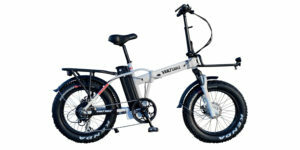 The default $3k version ships with an efficient 350 watt gearless hub motor that can reach 20mph top speeds with pedal assist or throttle operation. For $1k more, you can get a high-torque 500 watt gearless hub motor that can reach 20mph or 28mph top speeds for Class 3 performance. Both drive systems use an advanced torque sensor that’s built into the hub motor itself, vs. tacked onto the bottom bracket or rear dropout. 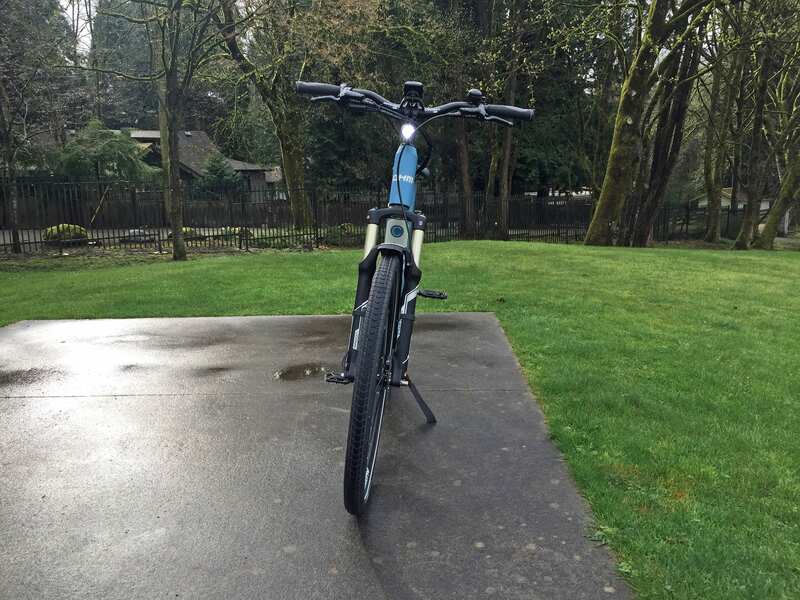 The bike accelerates smoothly and feels natural to ride. Additionally, both motors offer regenerative braking to reduce wear on brake pads while recuperating a bit of energy on long downhill sections of road. 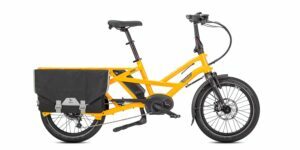 This ebike would make an excellent commuting platform, grocery getter, or neighborhood cruiser. 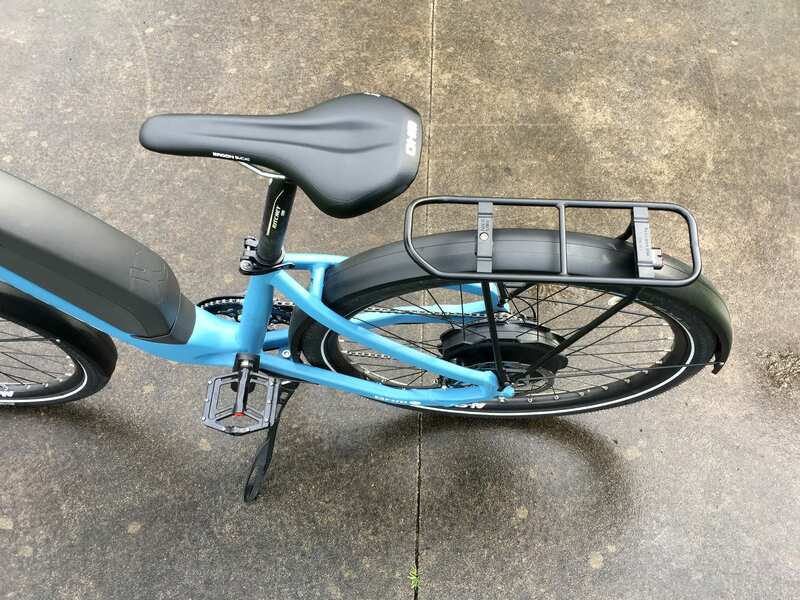 In my opinion, it’s also a wonderful option for shorter/smaller people and petite riders because of the low standover height and lower minimum saddle position (the seat doesn’t collide with the rear rack when it’s lowered all the way down, and the seat tube itself is lower than average). 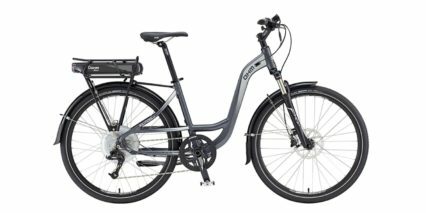 Whether you’re planning to mount a child seat, bring along extra cargo, or you just weigh more and need some power, it’s great to have so many options and such an approachable, sturdy frame here. What really sets it apart for me however, are the upgraded components, reasonable price point, longstanding reputation, and generous warranty. For roughly $3k, you’re getting tubular alloy fenders that won’t rattle, name-brand lights with metal housings vs. plastic, mountain bike grade hydraulic disc brakes with quad piston calipers and tool-free adjustable reach levers, comfortable Ergon locking grips and saddle, double wall rims with reinforcement eyelets for strength, a highly adjustable lightweight air suspension fork with thru-axle wheel mount, magnesium pedals with adjustable pins, and a sealed headset and bottom bracket that won’t rust or creak when they get wet. OHM is based in Vancouver, BC Canada near the ocean. It rains a lot there and a mixture of urban and mountain environments makeup the region. Their bikes are designed with this in mind, and my perception is that they can handle it. 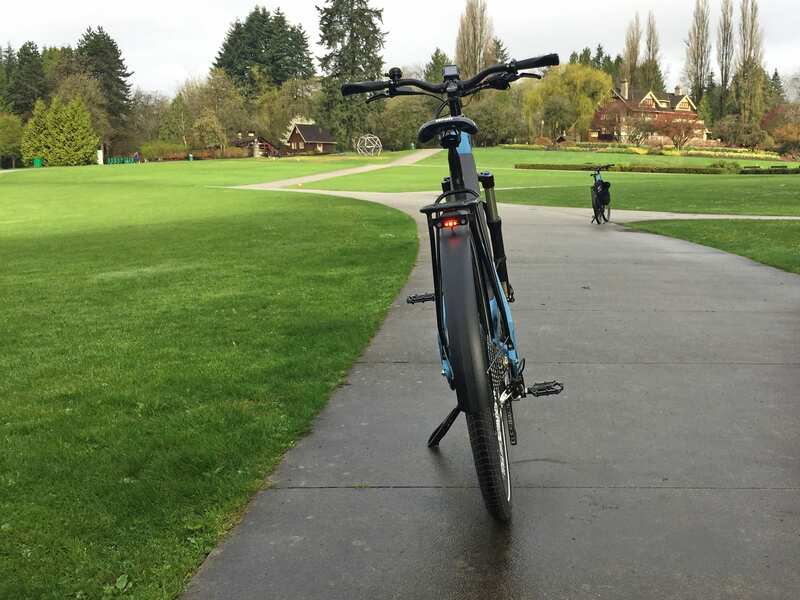 There’s so much to say about the design an parts that were chosen here, and perhaps some of these comments are lost on the average reader, but trust me… this ebike is made well. 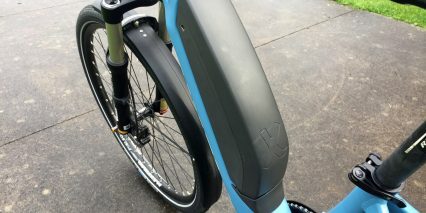 You can see the attention to detail in parts like the narrow-wide chainring that reduces potential for chain drops, the handlebar-mounted headlight (that points where you steer, won’t bounce around, and is positioned below the removable color LCD display panel), the double-tube frame that doesn’t flex as much as competing step-thru designs, the Shimano Deore XT drivetrain with one-way clutch and upgraded shifter mechanism for responsive gear changing, the sturdy alloy bash guard and performance-grade hollow spindle at the bottom bracket, the high-volume puncture resistant tires with reflective sidewall stripes, and the lightweight 3.45 amp charger that is smaller and faster than most. 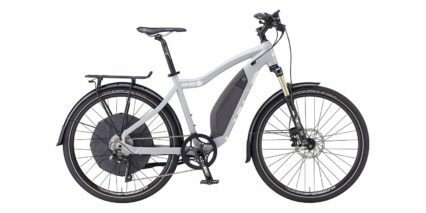 In so many ways, this ebike is overkill for city rides! You’re getting more than you probably need… but that’s because OHM is sharing parts across their entire line, to reduce costs and make servicing easier. 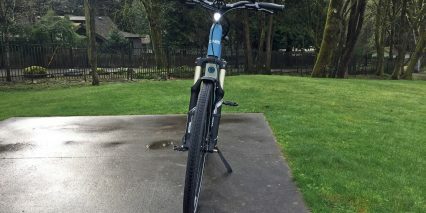 If you swapped the smooth urban tires for some knobby trail tires, this ebike would have no problem tackling cross-country mountain bike trails. OHM has been around since 2005, they are a premiere BionX partner, and their products are so good that they can offer a trade-in program and three year warranty. 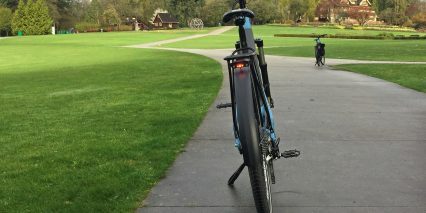 That’s very unique in the electric bike space. However, they are predominantly selling online now vs. in shops. And, as a result, test rides and fitting can be more difficult. 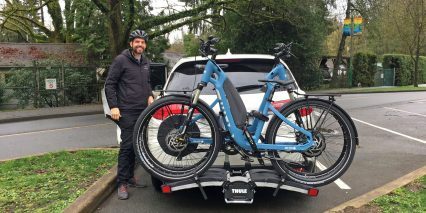 You may also have to endure unboxing, a bit of assembly, and repairs and fixes via email and phone support with the help of local bike shops vs. a more knowledgeable brand-specific dealer. 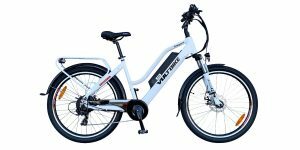 Driving the bike is either a 350 or 500 watt nominally rated, gearless direct-drive hub motor. With peak torque output at 50 Newton meters on the D-Series and peak wattage around 750, it’s one of the strongest legal hub motors to be found in North America. 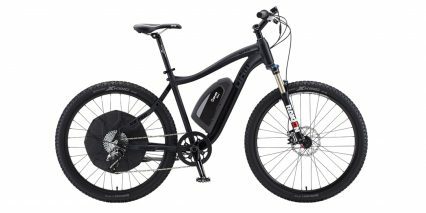 That extra power might be useful for people who encounter steep hills or plan on moving heavier loads… but it does cost $1k more as an upgrade. And it certainly looks unique… the design has grown on me over the past year but it’s definitely large (this motor is not shown in the images above, but you can see it on the high-step OHM Urban here). The large diameter on the D-Series motor provides a mechanical advantage for the magnets and electromagnetic staters inside, which increases torque while simultaneously improving cooling, due to increased air volume. The casing itself is a sort of composite plastic that is lightweight, durable, and unobtrusive in black. 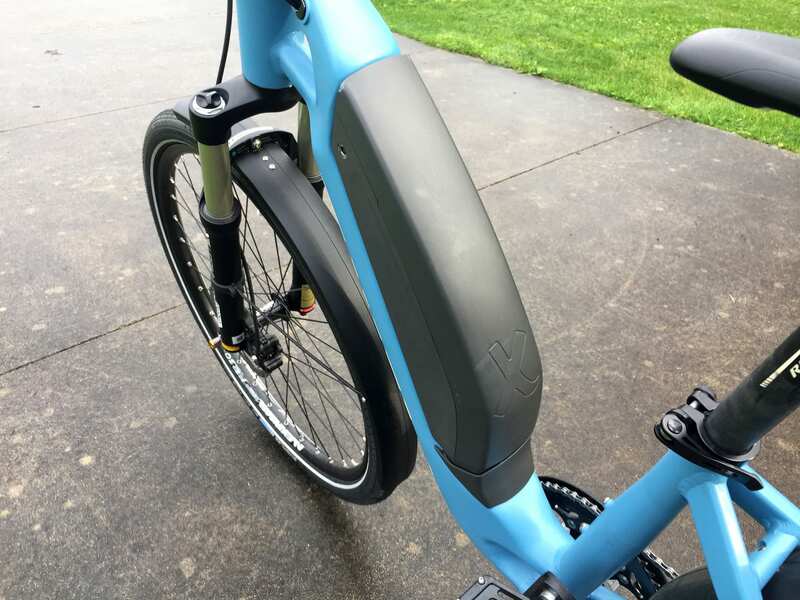 It won’t get scratched or nicked up the way that painted alloy casings might, and the spokes connect closer to the center of the wheel vs. the edge of the hub, which improves comfort. However, with such a large diameter, this motor does catch some wind from the side. 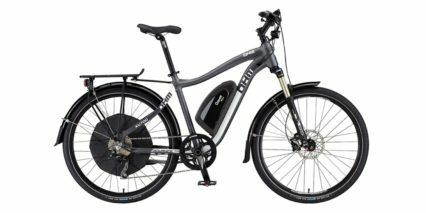 By comparison, the less expensive 350 watt motor is encased in an alloy hub that actually weighs more despite being physically smaller. It doesn’t offer as much torque, but is still very capable. Both motors are near-silent and both offer regeneration. 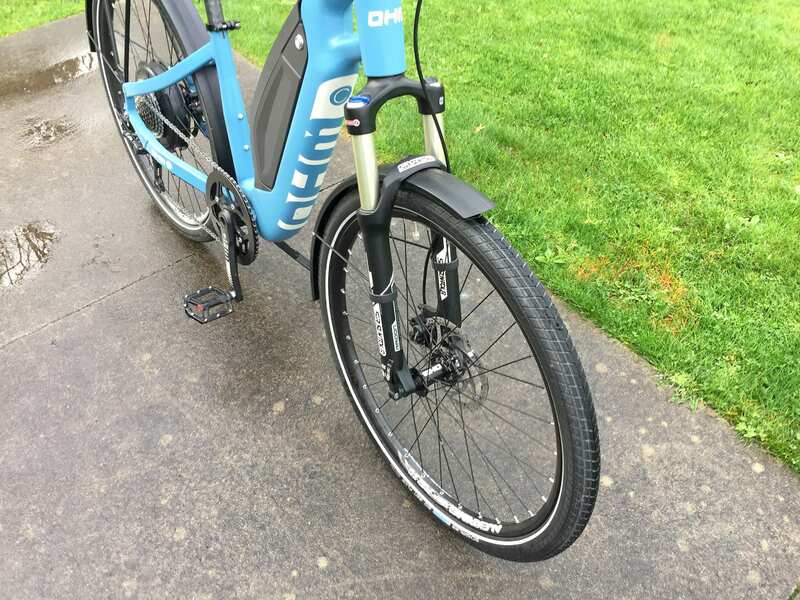 As mentioned earlier, OHM opted for double wall alloy rims with reinforcement eyelets to add durability on their mountain models, and the same rims have been used here. 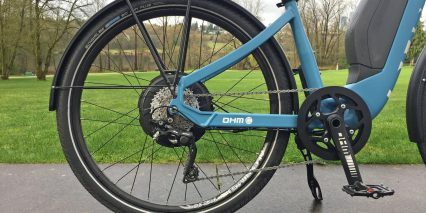 They painted the spokes black to match the hub motor casings, and they chose a capable drivetrain from Shimano to reduce maintenance intervals, speed up shifting, and improve chain tension. 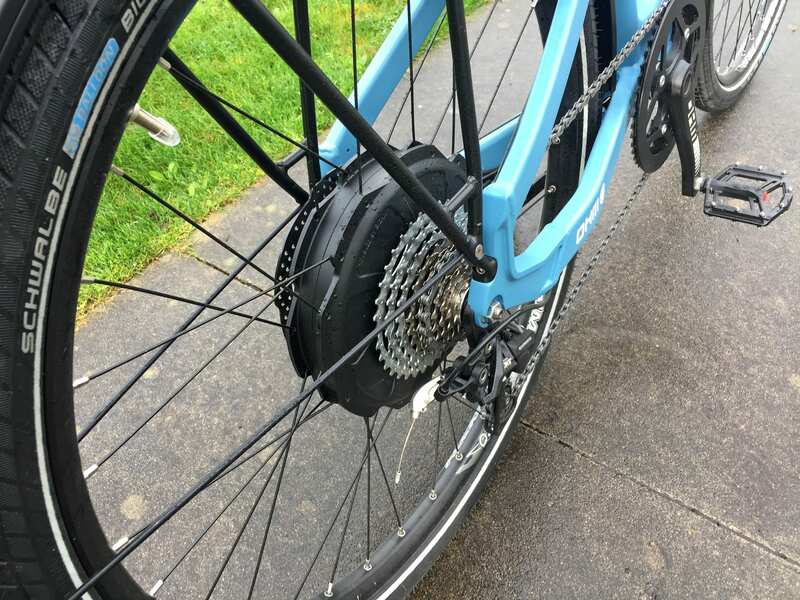 You get a 10-speed 11 to 36 tooth cassette here with Shimano Deore XT derailleur that has a one way clutch to tighten the chain. 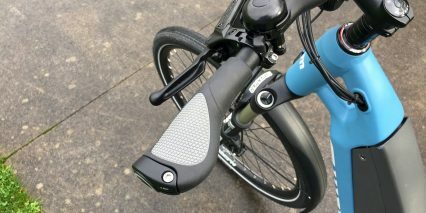 Just click the little grey lever up to increase spring stiffness for fast riding or bumpy terrain, or click the lever down for easier wheel maintenance and easier gear changing. I found shifting to be fast and quiet, the triggers were easy to reach and activate without taking my hand off of the right grip. 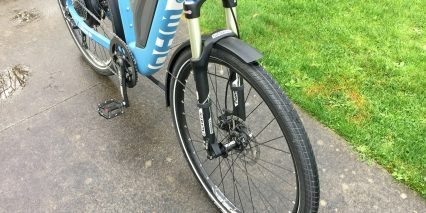 During the ride tests, I was pedaling naturally, feeling empowered vs. carried or pushed like some cadence sensing e-bikes, and never surprised or annoyed by delays from torque sensor to motor output. 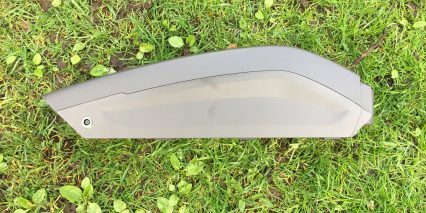 It felt very smooth but definitely more powerful than average. One thing to consider here is that the trigger throttle only becomes active once the bike has reached ~2mph. So, it’s not as helpful when starting after a stop sign or traffic signal. You’ll have to kick off and pedal for a second before the throttle will work. Still, the trigger throttle and control pad buttons are easy to reach and simple to understand. There’s a great balance of freedom and depth of settings against simplicity and intuitive layout. Just like the trigger shifters, the control pad is easy to reach and stays out of the way, making a clean cockpit. 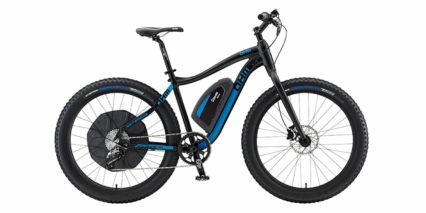 Powering the bike, backlit display, two integrated extra-bright LED lights, and an optional USB power port, is a high capacity Lithium-ion battery pack from BionX. It offers efficient 48 volts and 11.6 amp hours for a total of 556.8 watt hours of capacity. That’s over half a kilowatt hour, definitely above average! 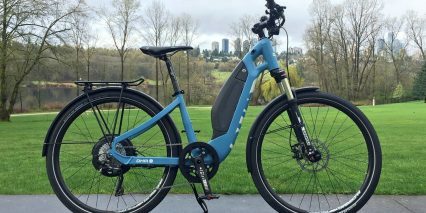 I estimate that the battery will provide a range between 25 and 70 miles, but that greatly depends on which motor you opt for and how you ride the bike. High speed operation takes a big toll on efficiency because of air resistance. Throttle mode, while fun, is a battery hog because the both motors offer above-average torque output and acceleration. The trigger throttle is ramped, so you can press gently for less power, but the actual buttono movement is relatively small (to keep it compact in size), so precise throttling takes some practice. Unlike many competing throttles, this one is easy to reach and not fatiguing to press constantly. It is perhaps one of my favorite throttle designs because it’s a trigger vs. twist and that means you can really grip and handle the bike well. In contrast, some twist throttles can compromise hand grip and position. I love that you can use the throttle at full power to override assist! There’s no need for clicking up and down through different menus to get the throttle active, the way some other products require. The throttle is always active as long as the bike is moving ~2mph, as mentioned earlier. Anyway, the battery can be charged on or off the bike frame and uses a quick 3.45 amp charger vs. the standard 2 amp I see elsewhere. 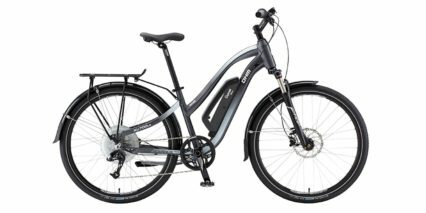 You can fill the battery quickly and get back out onto the road for more fun or extended rides… maybe even light touring! 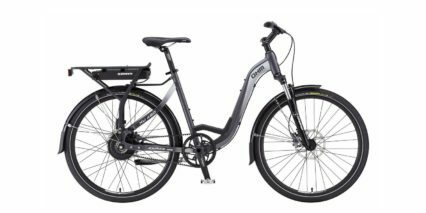 The removability of the display, battery, quick release front wheel, and seat post, make the bike easy to transport, protect, and store. I usually bring my display and battery into the office for protection and a top-off before riding home, and I always try to store these battery operated parts away from extreme heat and cold. 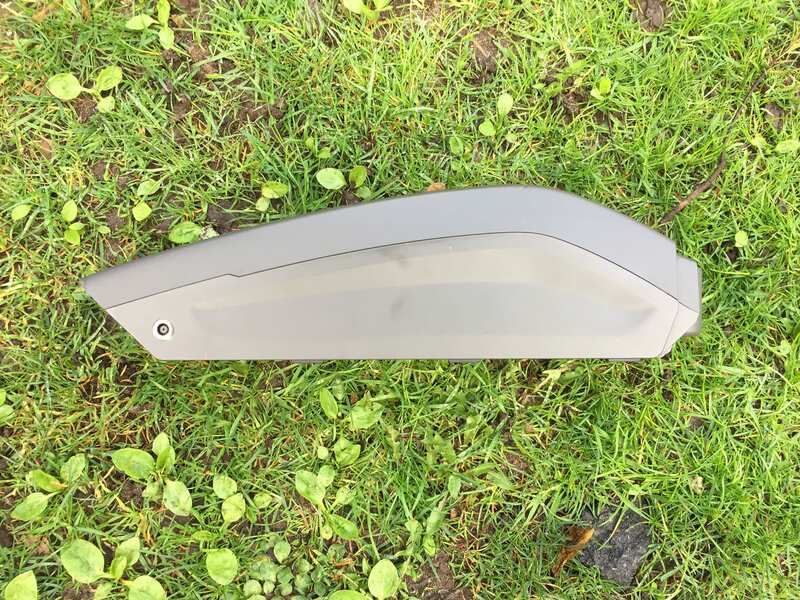 Note that the battery does not have an obvious handle and would definitely get scratched and possibly damaged if dropped… at 7.4 lbs, it’s not the lightest thing… so be careful when handling it or use a bag to carry it. 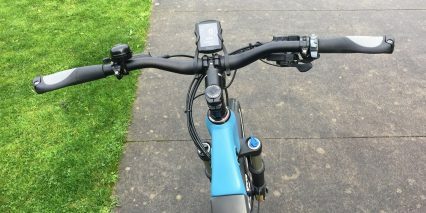 There’s a really cool touch-sensitive LED readout on the left side of the battery box which communicates charge level, whether the battery is mounted to the bike or not, and it’s quite handy. 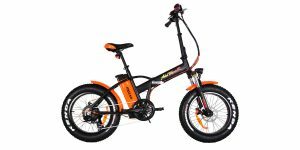 If you’ve got two of these bikes (or two models with the same battery), they are interchangeable and could be used by a single rider to double range (by placing the additional pack in a backpack). 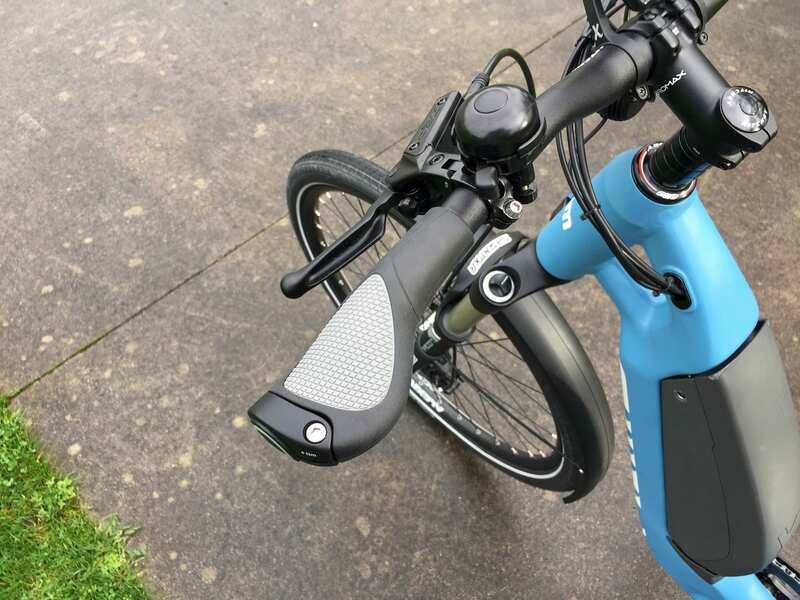 The display options on this electric bike are many, whether you choose to use the minimalist LED readouts on the control ring, the transflective backlit color LCD display, or your smartphone, you can control four levels of assist and four levels of regeneration. The + and – keys on the control pad are very intuitive. In it’s most basic form, you get to choose how much power the motor delivers or how much drag it introduces through recuperation. I used the highest level of regeneration -4 to help slow my descent for a full half hour when mountain biking on the OHM Mountain, and found that the battery recuperated about 3% capacity during that time (about 2.7 miles worth of energy). In addition to the plus and minus, there are also left and right buttons on the control ring which can be used to navigate the LCD display; to show different views. I preferred the basic view and loved that it showed 10 bars to illustrate how full the battery pack was… This is a big improvement over most displays that just show four or five bars, offering less precision. If you arrow to the right twice, you’ll discover an “advanced” or data view readout listing an even more precise battery percentage readout along with more trip stats and details. It’s so cool to have this as an option available, in part because data view is black and white vs. color, which could be less distracting for some riders during low lighting conditions. Note that you can also enter into a settings menu to adjust units and other aspects of the display by arrowing right to setup and then holding the grey key for a few seconds. This is definitely one of the nicest displays I have used and I love how open and flexible it is… while still being simple. Being able to take it off of the bike and still use the bike (with the control ring) is neat, and potentially very useful if you misplace the display or end up damaging it. 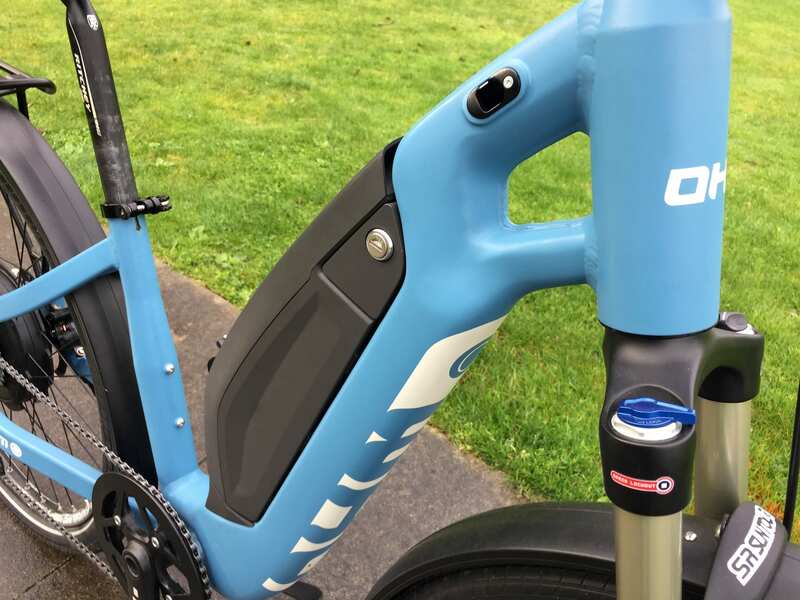 You could use the spot where the display is mounted for some other device for longer rides, if you wanted. 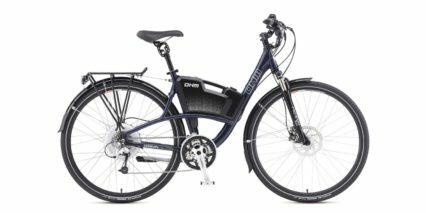 The OHM City, with default 350 watt motor, is the most affordable model in the lineup for 2018. I love the color that was chosen for the frame, satin blue, because it’s gender neutral. Branding is minimal, the paint job is classy and understated, and all of the cables are internally routed to reduce clutter. 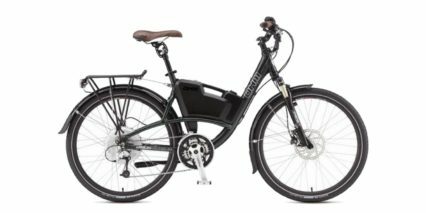 I sometimes hear people complain about the noise that some electric bikes produce when riding, Bosch Performance Line mid-drives and Bafang geared hub motors in particular, but that’s not an issue here at all. I personally like having a throttle at my disposal and love integrated lights because I commute in early morning and late night situations frequently, and want to be seen. 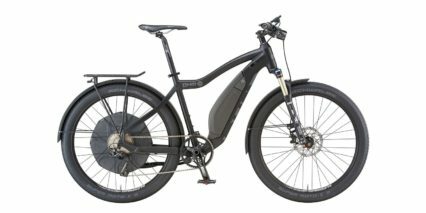 There are only a handful of little things that bug me about this model, including the mid-mounted kickstand that gets in the way of the left crank arm, the visual appearance of the larger hub motor (if you opt for the D-Series), the increased hassle of changing a rear flat tire because it uses nuts vs. quick release, the slightly longer boot up time of the display panel, and how the pedals feel because of a thicker spindle design. 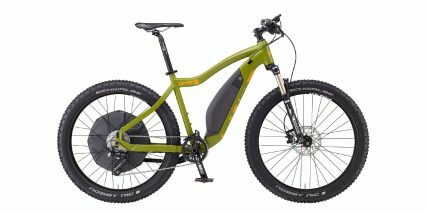 The 2018 OHM product line offers some of my favorite speed pedelecs on the market right now, and has built my appreciation for the small details that go into frame design and hardware choice. 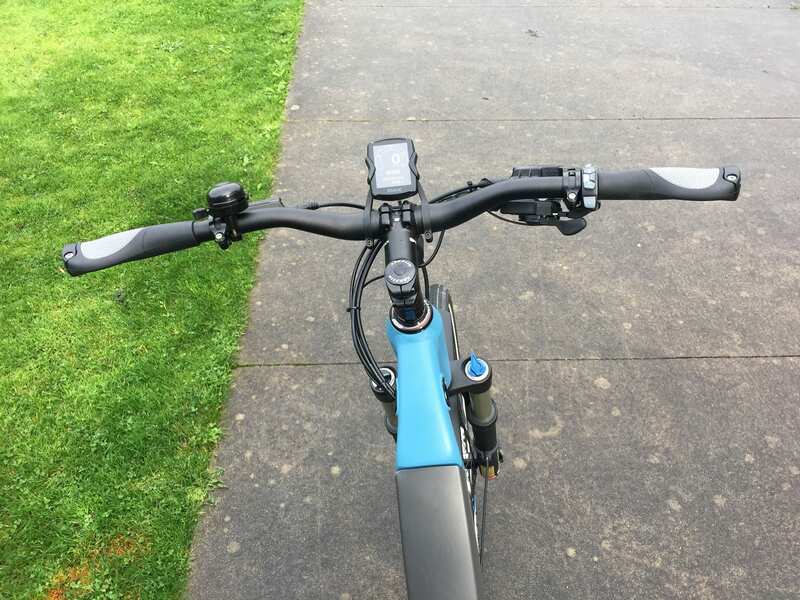 I probably would spend the extra money to upgrade to a suspension seat post (which OHM offers at time of purchase) because I have back and neck sensitivity, and high speed can really bring out the stiffness of a hardtail frame. 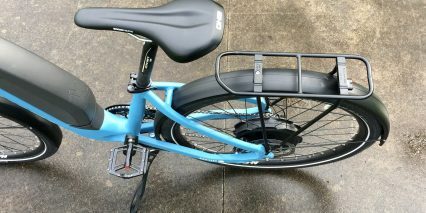 However, the larger tires, upright stem, additional stem spacers, and ergonomic touch points, make it pretty comfortable as-is. 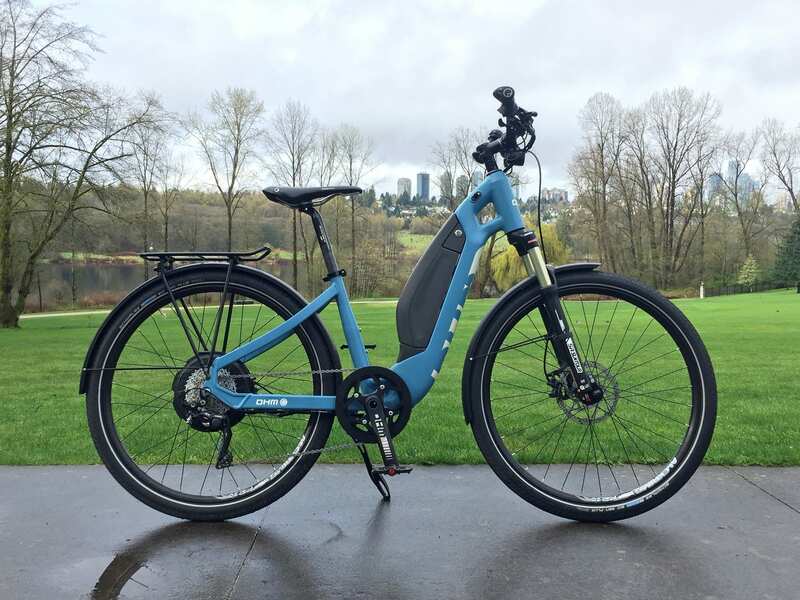 As you park and lock this e-bike, be sure to secure the front wheel, frame, and seat post and saddle rails if you do get the upgrade, because those are expensive premium parts. For reference, I was test riding the extra small frame but recorded measurements for it and the medium size (since that’s what Michael was riding, with the D-Series). 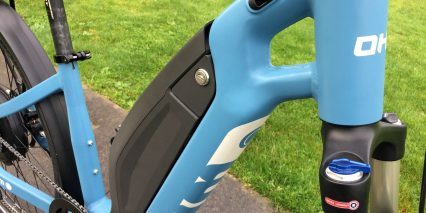 The rack uses standard gauge tubing for compatibility with a wide range of accessories, including clip-on bags like the Two Wheel Gear bike bags that Michael demonstrated. I appreciate the little bungee loop at the base of both support arms, for quickly securing smaller items. 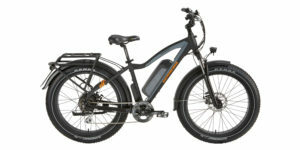 I welcome your comments below and in the OHM electric bike forums. I like how this bag doubled as a backpack with shoulder straps and had a padded section on the back, so the clips wouldn’t dig into your back. 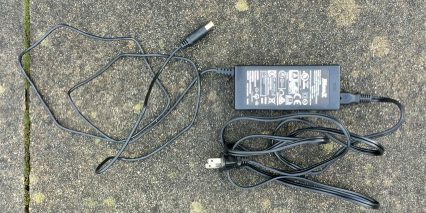 You could easily toss the battery charger into a bag like this and bring it along for a complete fill in just 4.5 hours. 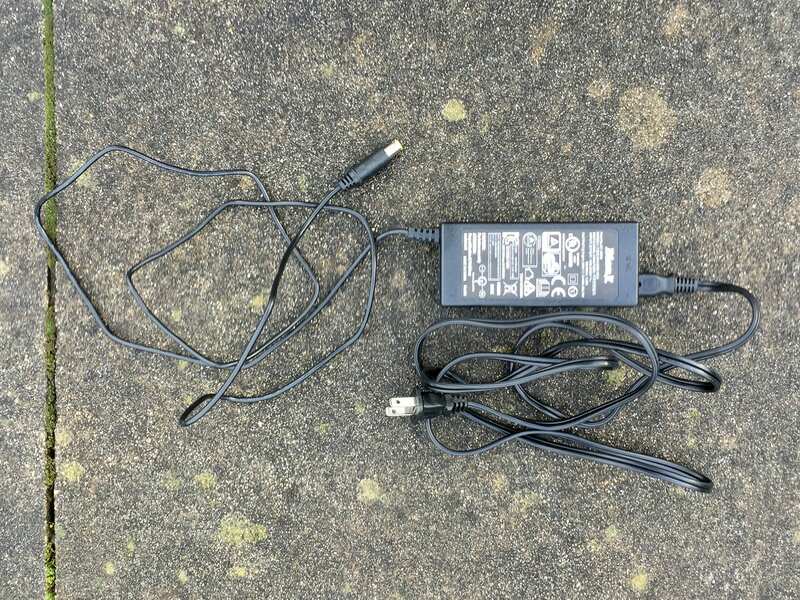 The battery and electrical components are rated IP67 against water and dust ingress, and I love how the plug end of the charger uses a magnetic connector that will pop off if tripped over vs. tipping the bike or pulling the battery off of a chair or counter top. The video review above was filmed at Deer Lake Park in Burnaby, BC Canada where the weather was cool and the ground was a bit wet at parts. I never got wet because of how wide the fenders were, and nobody seemed to notice or be bothered by our bikes because they are so quiet. 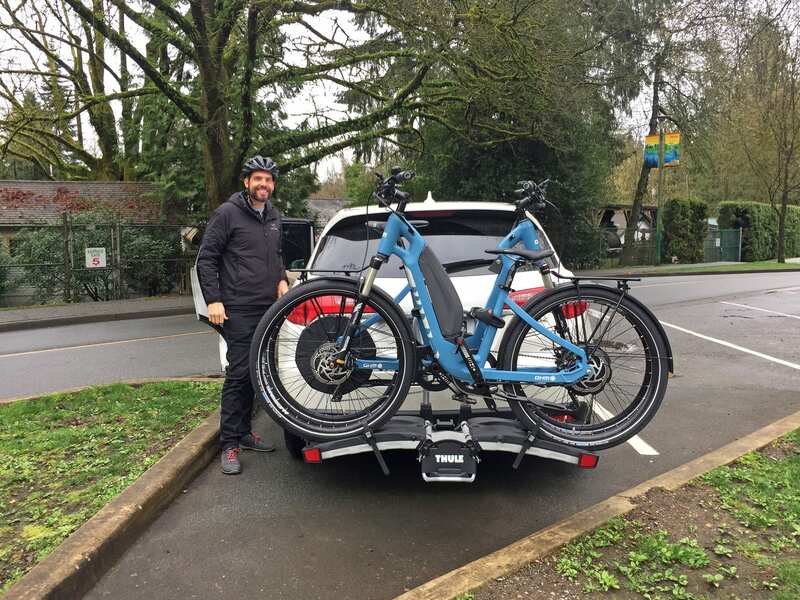 Big thanks to the founder, Michael DeVisser, for partnering with me on this post, meeting with me in Burnaby Canada for a test ride and interview in the video above. Hey Court did OHM talk about having a supplier relationship with Germany based BionX GmbH? 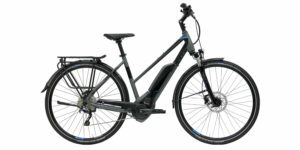 A recent article in Bike Europe reported the European operation had relocated production of BionX proprietary batteries and was looking to do the same for motors, but Elby Bike Europe exclusively uses the D series so it isn’t clear if the P and S series motors will also be produced – the Bike Europe article reported “BionX Canada’s subsidiaries, licenses, production and distribution rights as well as software are still for sale.” Source here. Hi Dewey! I spoke with a friend last week about the acquisition. Didn’t get all of the details, but it sounds like they bought the IP, website, and inventory with plans to continue support. I’m not in a position to say more than this, but was excited to see an unexpected new owner vs. the people who owned it before. 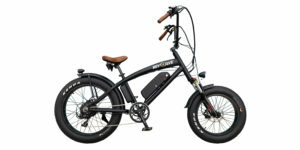 Thanks Court, this bike appears to be sold in Europe under the German Mi-Tech brand with the Bionx D-series motor, provided Bionx GmbH can relocate motor production as mentioned in the Bike Europe article then presumably Ohm would set up a supplier relationship to continue support. Source here. Thanks for the feedback, Rustin! I filmed this review in April, before some of the recent updates with BionX. Unfortunately, I’m not in a position to speak about what I’ve heard, but Michael has reassured me that he’s getting parts and business is going well. 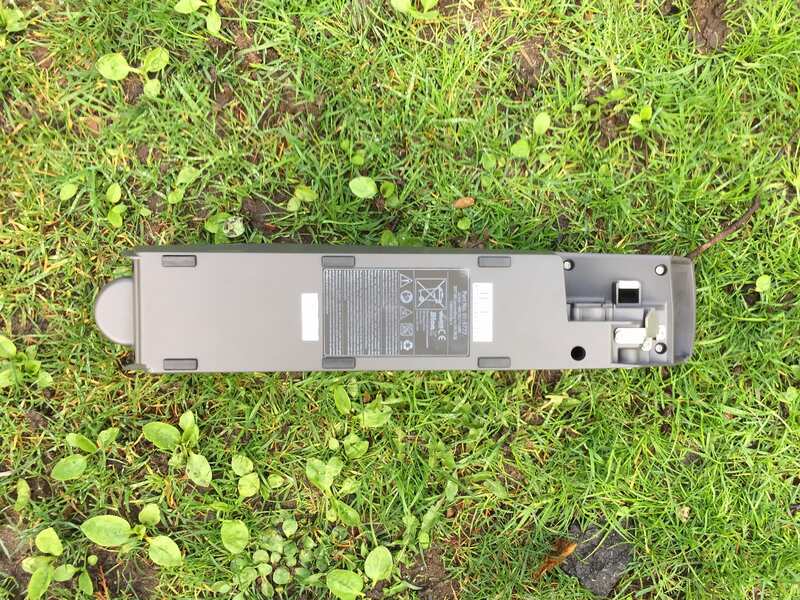 Another friend has been part of the new ownership for BionX (with their IP, website, and hardware) so I suspect that we will still see support for these motors etc. and that’s why I didn’t go into it as much with the writeup. Your comment is welcome here, I’m just not sure that the bankruptcy of BionX when it was owned by different people will impact the longterm availability of hardware or OHM’s products as much as some might be concerned about. Great Review Court. Thanks once again. 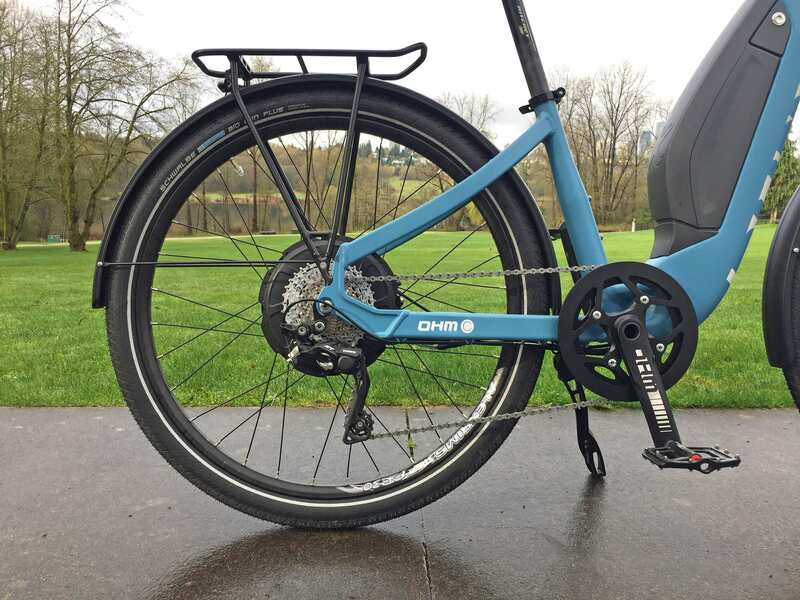 It seems like OHM has been producing really nice bikes with a hub motor that bucks the trend of many higher end ebike manufacturers transitioning to mid drive motors like Bosch, Brose, Bafang. 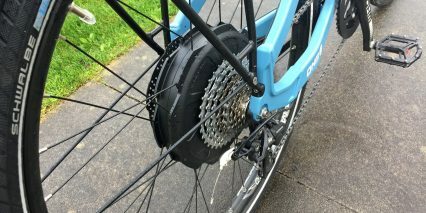 I had pretty much decided to focus on the newer mid drive bikes, but your review of the OHM models renews my interest in this hub drive from BionX. Trek, Specialized, Riese & Mueller, Evelo… all mid drives, and here is a top quality builder with a great bike that’s a hub drive. Exciting… but confusing. 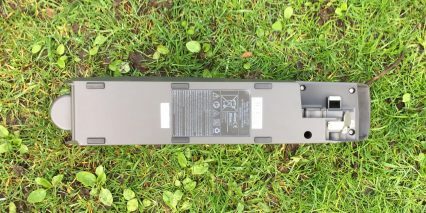 Do you see advantages of this drive over the others mentioned above? Sorry it’s a bit confusing with the extra choices. 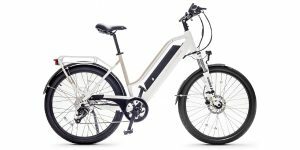 There are quite a few ebikes to compare these days, and it’s neat to have the options even in terms of colors and sizing that we didn’t have just a year or two back. I am so happy to read this review. I feel like I’ve been patiently waiting to learn more about the step thru since your preview from Interbike. I got to ride an OHM Urban this year on flat city streets and liked it a lot. I felt it was easy to maintain around 23-24 mph but I think 28 would be difficult for very long. So cool how quiet the bike is. I really admire this company clearly trying to build the best bike they can make. Hi Steve, I enjoyed reading your comment and have the same hopes for and attraction to the BionX systems. Their display is great, the button pad and throttle are intuitive and effective, the motors are quiet and unique with big torque and regen advantages over almost every other product. The D-Series is relatively lightweight but very capable… and I do think that the company will overcome some of the challenges and get a lot more healthy with this change. I wish I could say more, I think the new team is just really focused and hasn’t gotten back to me with any details (or maybe it cannot be made public because they are still working on decisions etc.) OHM would be good to contact directly. Michael can usually be reached and is very calm, competent, and reassuring.